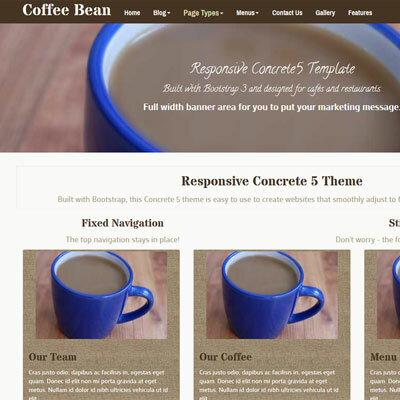 Coffee Bean is a responsive website designed for cafés and restaurants, built with HTML5, CSS3 and Bootstrap v3.1.1. This template will adjust to different browser widths, and content looks good on a mobile or on a tablet, such as I Pad. 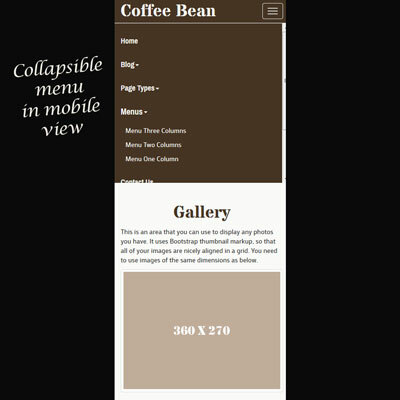 When viewed on a mobile, a collapsible menu is displayed. If you hate it when the footer won’t stay at the bottom of the page, don’t fear...we have added a “sticky footer” to this template so that it stays put. The top menu is a fixed top menu, so when you scroll down the page, the menu will stay there at the top. Concrete5 is, in our opinion, very user friendly! We have tried to also make our template user friendly and simple to use. We have provided step by step instructions for various parts of the site. You can also view our demo site to see it in action. 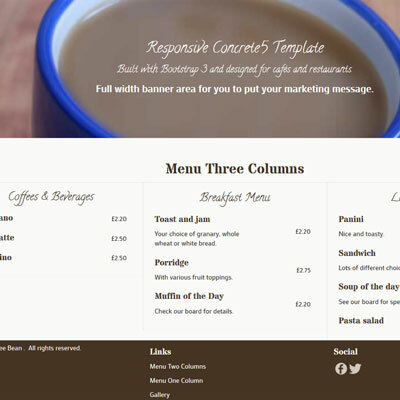 There are three pages for creating menus – one column, two columns and three columns. You can add menu items and headings simply by using our custom blocks. You can change the colour schemes to match your brand in the customisation panel. Don’t worry, knowledge of coding is not necessary! Full width banner that you can change on every page. Fixed top menu and “sticky footer”. Three pages for creating your menus. Responsive layouts that are mobile and tablet friendly. Customisable colours without the need to code. Several page types allowing flexibility in layout. Grid-style photo gallery allowing you to display images in a stylish way. Custom blocks for creating thumbnails, menu items, menu headings and buttons, and also adding responsive images. Coded with HTML5, CSS3, and built using Bootstrap as the framework. If you are upgrading from Bootstrap v2x, please note that the new version is using Bootstrap v3.1.1 and there have been extensive changes in Bootstrap since version 2x. 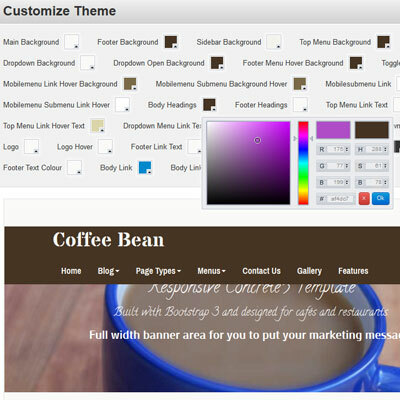 You do not need to upgrade to the new version of Coffee Bean unless you want to have the new Bootstrap version. If you do upgrade, please be careful to back up your site first and note that there are some changes detailed in the Bootstrap documentation and in the Coffee Bean version history page. If you are upgrading your Coffee Bean theme v1.3 or v1.2, which were using Bootstrap v3.0.3, you should be able to upgrade without any major changes to your site, but check Bootstrap documentation first if you are unsure.